Rise above the limits of your current large format document capabilities with the Océ PlotWave® 750 system. Gain the edge for your business. Print more flexibly. Protect vital data more securely. Produce documents faster and manage print jobs more easily. Many decisions in the technical world are made on site, and documents need to be updated and produced in flexible ways. Users can now use Océ Mobile WebTools or Océ Publisher Express to capture changes and documents anytime, anywhere. Or print via Océ Publisher Select™ software to produce documents for complex projects. These new networking capabilities are supported by stringent security measures. Meet short deadlines and work efficiently with the instant-on performance of Océ Radiant Fusing technology. 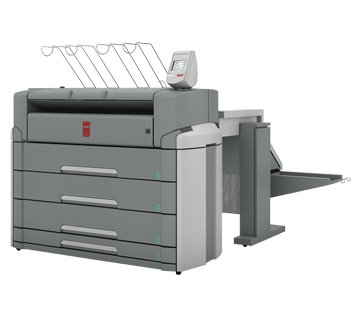 Get over 27 D-size (A1) prints, before others have even started printing and consistently turn out 9 D-size (A1) prints per minute, even with mixed sizes. With 6 media rolls,the Océ Double Decker Pro stacker and built-in cutters, you can print and stack up to 3,444 feet (1,050 meters) of output without interruption. Scan and copy as-builts, color markup and other technical documents in one quick and easy step for immediate archiving and distribution. Don't buy Océ Plotwave 750 without contacting Napco. Call us today at 1-866-752-6766.